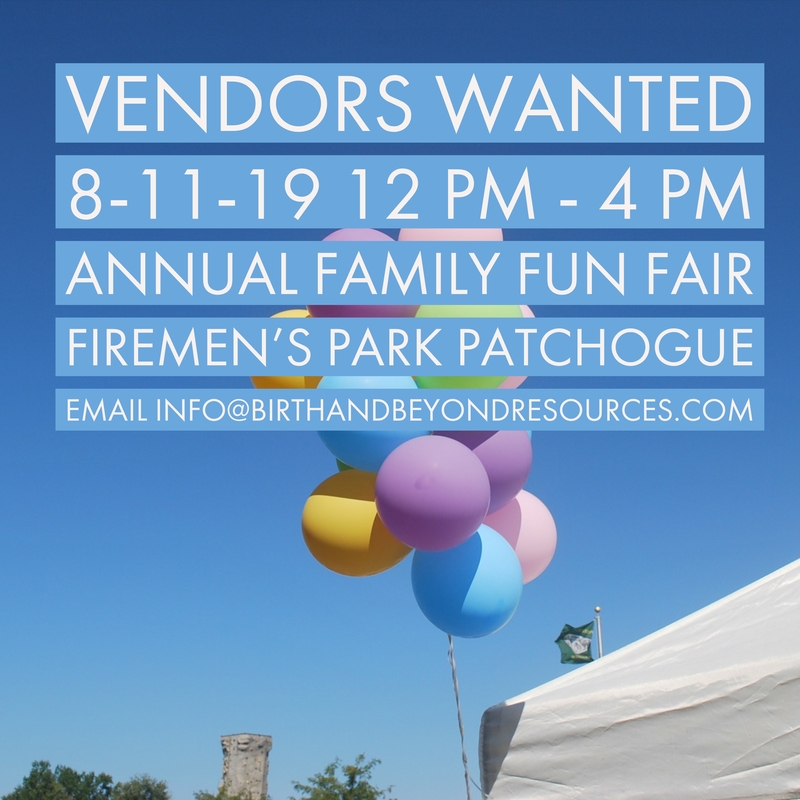 This Outdoor Family Fair is being held on August 11th from 12 pm to 4 pm at Fireman’s Park located at 10 Dewitt Avenue in Patchogue, just east of Shorefront Park. Members receive discounts at local businesses and special advertisement abilities. For a Member Application, visit www.birthandbeyondresources.com and click Birth and Beyond Membership. Vendor Fees are tax deductible. Deadline for application submission is July 15th, however, there is limited space available and booths will be given on a first come first serve basis. Vendor Type will also be limited. For example, we will only allow one distributor from each Direct Sales Company. Some exceptions can be made. This will also be first come, first served. You must provide your own tent if desired, tables, chairs, etc. All vendors must check in between 10:30 am and 11:30 am. Booths must be completely set up by 11:45 am. Check ins after 11:30 am may be subjected to forfeit of their location with no refund. Vendors must remain open for the full duration of the fair. Booth breakdown can start at 4 pm. Booth spaces are not accessible by vehicles. You must be prepared to bring your setup to your location. A hand truck or wagon is highly suggested. Vendors will have from 4 pm to 5 pm to pack up and clean their area. Vendors are responsible for leaving their area in the condition that it was received. All trash, debris, boxes, etc. must be cleaned up. There will be trash cans available for your convenience. Further directions such as a map and directions of fairgrounds, your booth location numbers, etc. will be emailed once finalized. This event is rain or shine. Please be prepared for wind/rain/heat/cold.